The ECP committee invites you to attend the next webinar in our series. Glade Ellingson, PhD will present on Informed Consent and Confidentiality & its Exceptions: An Overview for Utah Psychologists. Providing meaningful informed consent and protecting the confidentiality of those we work with are primary obligations of psychologists. While the ethical principles that govern these obligations are constant, exact reporting requirements vary somewhat from jurisdiction to jurisdiction. This webinar will give a brief overview of informed consent and confidentiality practices and highlight Utah’s required exceptions to confidentiality, including mandated reporting. For those who have interns or other trainees who will be arriving later this summer, please feel free to forward them this email so they can learn more about our specific laws before they arrive. These webinars are open to all psychologists/trainees. 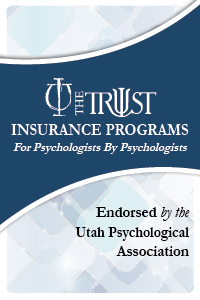 The ECP committee would like to thank The Trust, a provider of professional liability insurance, for their generous support which allows us to offer these programs for free. If you have ideas about future webinars, particularly if you are interested in presenting, please contact me backchannel at jamiebrasspsyd@gmail.com.